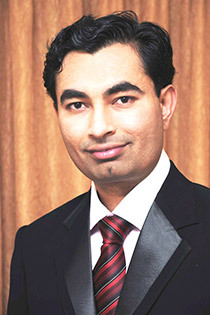 Dr. Amit Jhala, University of Nebraska assistant professor and Extension weed management specialist, has been honored with the Distinguished Achievement Young Weed Scientist Award from the North Central Weed Science Society of America. This award recognizes outstanding contributions made by a young weed scientist in research and/or extension in the north central region. Jhala has been with the University of Nebraska-Lincoln since 2012 with a split appointment between research and extension in Department of Agronomy and Horticulture. His research program focuses on the biology, gene flow, and management of herbicide-resistant weeds. He is specifically interested in pollen-mediated gene flow from herbicide-resistant crops and weeds. An early career scientist, Jhala has 61 papers published/accepted in peer-reviewed journals and has published 11 book chapters. Jhala’s paper about gene flow published in Heredity (a journal of the Nature Publishing Group) was not only recognized by the journal, but the paper led to a commentary published in the same issue of Heredity discussing the statistical methods used in the study to determine the minimum sample size needed to detect gene flow. A contributor to CropWatch, Jhala has developed a weed science extension and outreach program that promotes a more sustainable corn and soybean production system by teaching the principles of safe and cost-effective weed management, primarily through the management of glyphosate-resistant weeds. He coordinates the Crop Production Clinics which on average are attended by 1,500 to 1,800 clientele annually. He also organizes Corn and Soybean Weed Management Field Days and Herbicide-Resistant Weed Management Field Days and serves on the Board of Directors for the North Central Weed Science Society where he chairs the Extension Section. Jhala will receive the award at the 71st North Central Weed Science Society’s annual meeting in Des Moines Dec. 12-15. This entry was posted in Agricultural IPM, Center News, Field Crop IPM, Weed Management and tagged awards, weed science. Bookmark the permalink.